Alliance offers flagship and market-leading help desk solution built on Alliance UC 2000 (IPPABX) and Alliance Ensembler (CRM) which offers a unique proposition to varied industry verticals. The system is designed to deliver exceptional customer service. It provides incident, inquiry tracking, ticket generation, ticket management, escalation matrix, record management, reports, and unmatched automation. The system allows unmatched integration of self-service (IVRS), knowledge management, IP telephony, call recording, customer data management with optional integration option of voice mail, email, SMS, fax, web and Kiosk. The system allows the customer to experience elite technology in the modern world. IVRS: The system offers automated resolution over the phone by checking data-based, it reduces call volumes for agent handling. CRM: Maintains customer data, manages customer query, FAQ’s with resolution, manage escalation, ticket generation, closure of tickets and reports. Voice Logger: Quality monitoring solution to ensure enhanced customer service and helps to draw agent performance and align training process. FAX: Enables customer to receive printed material like collaterals, brochures and flyers or account details for reference. A dynamic integration allows the customer to make an automated request and automated process without talking to an agent and wasting their valuable time. 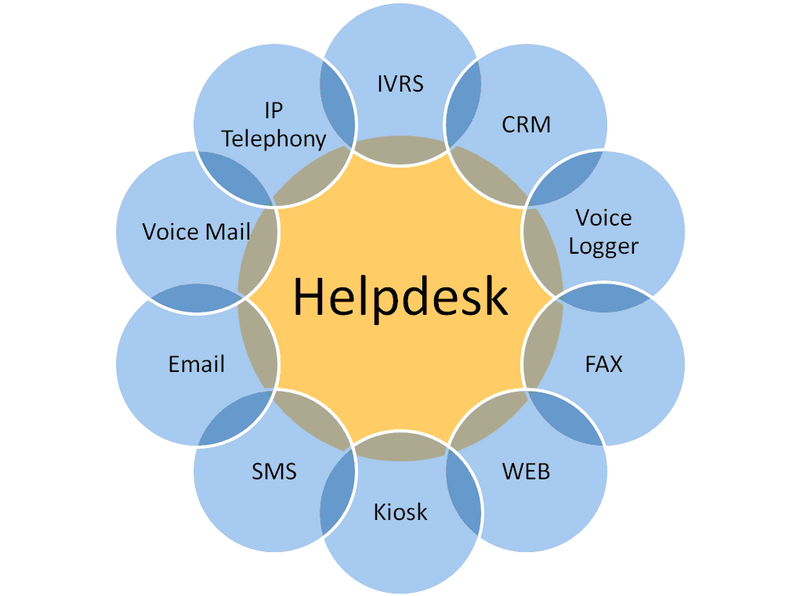 WEB: The system allows seamless integration with the web where the customer can complain through a web, check the status online if don’t want to make call to helpdesk. Kiosk: Kiosk integration offers ease to the customer and to be able to service customer from the varied physical presence that organization has without engaging human intervention. Also able to service differently abled. SMS: SMS integration in helpdesk is to get pole, complaints or to advertise and there are situations where organization check their CSAT scores by sending SMS. Email: The system offers email integration to be able to service customer the best. Voice Mail: The system offers the customer to leave a voice mail during nonworking hours or holidays which can be addressed during regular days. IP Telephony: The system offers the latest blend of technology reducing geographical boundaries and enhanced communication.